Spring is the perfect time to complete some backyard landscaping to improve the look and feel of your home. We’ve put together a list of five great backyard projects that you can finish by the end of spring so you can enjoy them all summer long. Better yet, all of these projects work well with any home or budget. Read on to see what they are! A fire pit makes a great addition to almost any backyard – it provides a central gathering spot for outdoor activities, adds visual interest to your yard, and can be used to cook out or just keep warm during chilly fall evenings. Fire pits come in a variety of sizes and styles, from simple stone-ringed campfire circles to exquisitely constructed backyard structures. But in every case, you’re sure to enjoy the way it looks in your yard and the entertainment it makes possible. If you’re looking to add visual interest with something a little more green, you can always create some appeal with evergreen trees. Spring is a good time for planting; just make sure your new trees can get adequate water when the weather warms up. Remember to choose a tree that can handle heat and dryness, as many long-needled firs will dry out quickly in the hot Texas summers. Or if you want to keep long-needled trees, you can always install an underground irrigation system to keep them green all year. The cooler spring season is a great time to work on your outdoor structures. For instance, the lower temperature days are a great time to paint, stain, or even replace your tired old fence. 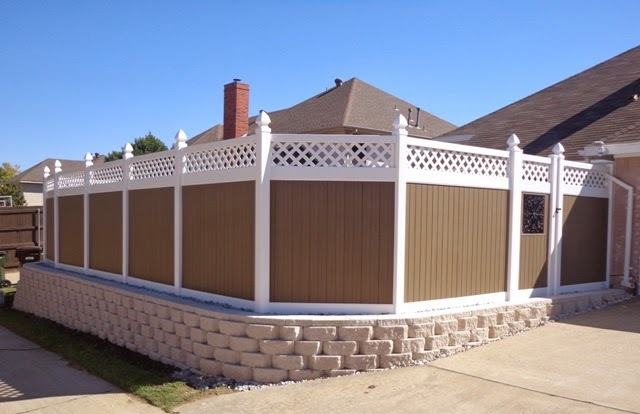 If you’re tired of having to perform maintenance on your fencing year after year, replacing your wooden fence with a new vinyl fence is a great option. Vinyl fencing is stronger and more durable than wood, and it doesn’t need to be painted or stained. This could be the last spring you’ll need to work on it! A great spring project for those of us with lots of grass is to get it ready for the year’s growing season. Simple tasks such as aerating your soil, feeding the grass and soil with high-phosphorous plant food, and cleaning up fallen leaves and branches can help your grass get green earlier and grow hardier during the spring and summer. Spring is also a great time to spray for weeds, as they won’t grow back as quickly in the cooler temperatures. Do you have some more great ideas for spring landscaping projects? Leave a comment below to tell us about them, or call us for more ideas on how you can improve your backyard with functional and attractive yard structures. You can also follow Future Outdoors on Facebook and Google+ for updates and special offers!